Written as a facilitating tool with Freetown as a case study. This manual was borne out of a strong desire to bring development to a city that has remained neglected by the powers that be; one that lacks the development and maintenance culture, badly in need of attention. The simple, but very practical ideas clearly outlined in this development and governance manual take away the impossibilities and complexities in achieving the dream of reconstructing a downtrodden city like Freetown, or any other deprived city in Africa, into a place fit for the cream of society to live happily with the rest of the people. 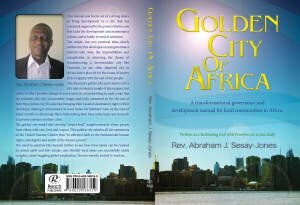 The dream of a golden city of Africa is not just to turn a city into a concrete jungle of skyscrapers, but rather to effect positive change in every facet of urban dwelling in such a way that the residents feel very comfortable, happy and truly contented to live the rest of their lives in that city. It is also like bringing their vacation destination right to their doorsteps, making it unnecessary to leave home for holidays! Also, in the case of today’s youth: to discourage the youth from risking their lives in the high seas in search of greener pastures in other cities. The golden city of Africa would also develop “utopia-kind” neighbourhoods where people treat others with care, love and respect. This golden city satisfies all the aspirations of the United Nations Charter that “reaffirmed faith in the fundamental human rights, and dignity and worth of the human person”. Abraham Sesay-Jones is a patriotic Sierra Leonean and the Senior Pastor of Family Chapel Ministries in Freetown.